An easy bean burger with a little crunch from sunflower seeds and a subtle smoky flavor, these work well with pink, pinto, or red beans. Make some potato oven fries or sweet potato oven fries at the same time, and serve with your favorite condiments in pita bread or on whole grain buns. Combine the oatmeal and 2/3 cup boiling water in a cup. Let stand until needed. Place 1/4 cup of the sunflower seeds in a food processor, and set aside the 2 tablespoons. Pulse on and off until coarsely chopped. Add the beans, bell pepper, scallions, wheat germ or hemp seeds, seasonings, olive oil, and optional nutritional yeast.to the food processor. Pulse on and off until the mixture is finely and evenly chopped. Don’t puree! Line a baking sheet with parchment paper. Coat the inside of a round 1/2-cup measuring cup (for large burgers) or 1/4-cup measuring cup (for sliders) with a little oil or cooking oil spray. Spoon some of the bean mixture into the measuring cup, filling it but not packing too firmly; invert it onto the parchment (giving it a sharp tap to release the mixture). Using the bottom of the measuring cup, flatten into a 1/2-inch- thick burger. Repeat with the remaining bean mixture; you should wind up with 6 regular size burgers or 12 smaller sliders. Bake for 15 minutes, then carefully flip each burger and bake an additional 15 minutes, or until golden and firm on each side. Remove from the oven and serve the burgers on their own or with the bread and/or condiments of your choice. Note: Look for smoked paprika or mesquite seasoning in any supermarket spice aisle. Mesquite seasoning is particularly nice in this; you’ll find it shelved with grilling seasonings. You can also substitute liquid smoke seasoning if that’s what you have on hand. 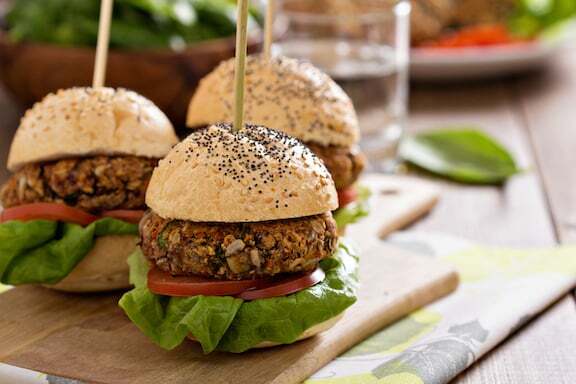 Here are more of our tasty Vegan Burgers. 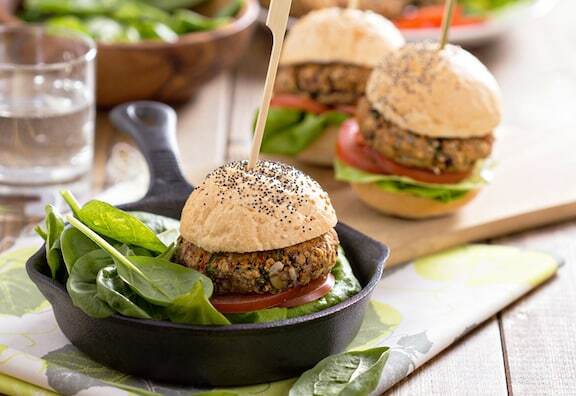 I’ve been looking for a veggie burger that’s both delicious and easy to make. This looks like the winner. Thanks! Sounds yummy. Do you have any suggestions for a sub for the wheat germ besides hemp seeds? Susan, since you’ll be using oatmeal as a binder, you can try substituting more oatmeal, dry. Use a bit more than 1/2 cup, since wheat germ or hemp seeds are denser by measure.